This article is developed as an ultimate guide on RFID reader module and RFID tag – and explains how it works. We have published many interesting projects using an RFID reader module – like RFID Attendance Management System, Â or RFID based Access Control System. We have also published simple RFID reader based projects like a Simple RFID Door Lock. All these projects make use of an RFID reader and an RFID tag. This article helps you understand more about an RFID reader and tag – how they look, how they operate, how to use an RFID reader/tag and different other applications using an RFID reader. What is meant by RFID reader? RFIDÂ technology was first used during world war 2 to identify enemy aircrafts. Since then RFID technology has evolved and is now used in many different industries. One clean example is a smart warehouse where the process of warehousing is automated using RFID Technology. Watch the video given below to understand an RFID warehouse. An RFID system consists of two parts 1)RFID Reader and 2)RFID Tag. Data is stored in the RFID tag electronically. This data is retrieved by the reader using electromagnetic waves. Tags can store only a few kilo bytes of data. The operation of an RFID reader is very much similar to barcode scanning method which uses UPC (Universal Product Codes) codes. In some applications, RFID has advantages over the barcode system. Here are some advantages offered by an RFID System over Barcode System. RFID does not require Line of sight like the barcode. Read rate of RFID tags is more compared to Barcode. This means an RFID reader can read more than 40 tags at a time. RFID has the ability to Read, Write and Update the data present in it. While the data in the barcode cannot be changed. RFID system uses radio waves for communication between the reader and tag. RFID reader automatically identifies the objects (tags) and collect the data from them. Hence they come under a group of technologies called AIDC (automatic identification and data capture). What is an RFIDÂ Reader? 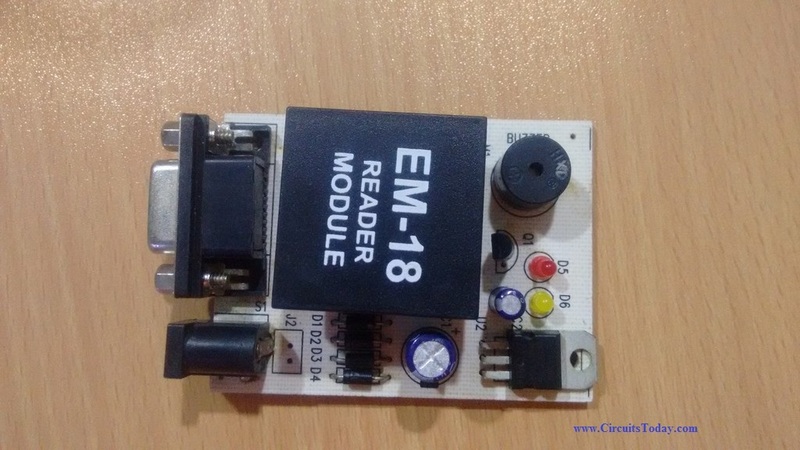 The image given below is that of an RFID reader module. The RFID reader has a radio transmitter and receiver inside. It is also called as an interrogator. The reader transmits radio frequency signals continuously upon powering. 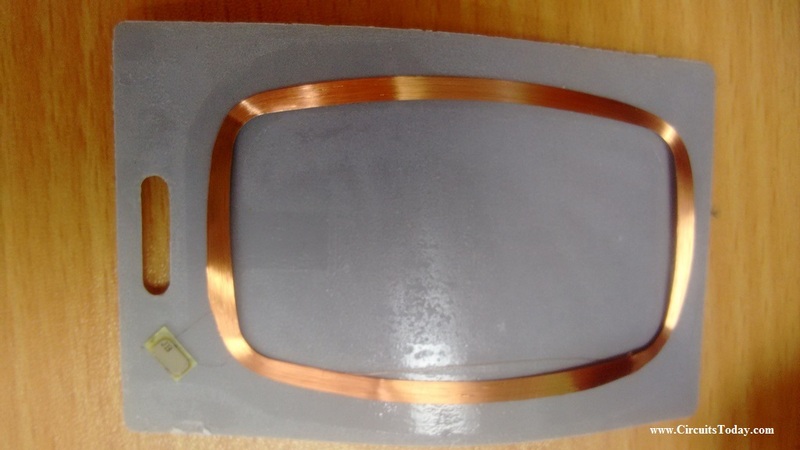 When an RFID tag is placed inside the range area of a reader, it energizes the tag through electromagnetic induction and collects the information from it. The image given above is that of an RFID tag (smart card shaped tag). RFID tags are available in different types of size and shapes. The Tag contains an IC for storing the data, an antenna for transmitting and receiving, and also a modulator. Tags are very small in size and they can hold only few bits of data. 1) Active and Â 2) Passive. An RFID tag can be defined as an active tag, when it has its own power source and allows the user to erase and update the data inside the tag. Active tags are available with an external battery. Active tags are usually operated at different frequencies of 433Mhz and 915 MHZ. Generally 433Mhz is preferred because of longer wavelength . They can be read from a distance of 100 feet or more, that is they can communicate over longer distances. They are expensive compared to passive tags. The transponder tag uses the battery effectively. It waits until the RFID reader sends a signal. These tags respond to the reader signal with the necessary information. They utilize battery only when required. If the tag is out of the range of the reader, the tag moves itself into off state. Transponder tags are mainly used in toll booth payments and security access control systems. As the name indicates, beacon tags continuously transmits the signal every 3 to 5 seconds. These are very common in mining , oil and gas and cargo tracking industrial applications. They can provide long communication range. They have highest data bandwidth. They cannot work without battery. Active tags are larger in size, hence not suitable for all kinds of applications. Passive tags are activated only when it receives a signal from the reader. This signal activates the internal IC of the tag through antenna. Thus the tag sends the required data stored in it to the reader. These tags do not use any external battery. They are powered up by using the power from RFID reader. The data in the passive tags is pre written. One cannot change the data in these tags. These tags are generally used for applications such as file tracking, race timing etc. 1)Low Frequency(125-134kHz): AtÂ this frequency level, Â the range of the reader up to which it can read from the tag is very short. It is aboutÂ 1-10 centimeters. 2)High Frequency(13.56Mhz): The range of RFID at this frequency level is 10 centimeter to 1 meter.Â This frequency can be used in applications where short range is sufficient such as passport security, security access control etc. 3)Very high Frequency(865-960MHz): The range of reader at this frequency is about 5 to 6 meters. Larger UHF tags can read up to 30+meters. Such UHF tags can be used in applications such as file tracking, IT assets tracking etc. They are smaller in size. They last long as they do not use any battery. These tags can be used only for short distance communication. The data written in passive tags cannot be updated. Take a look at the image given below. 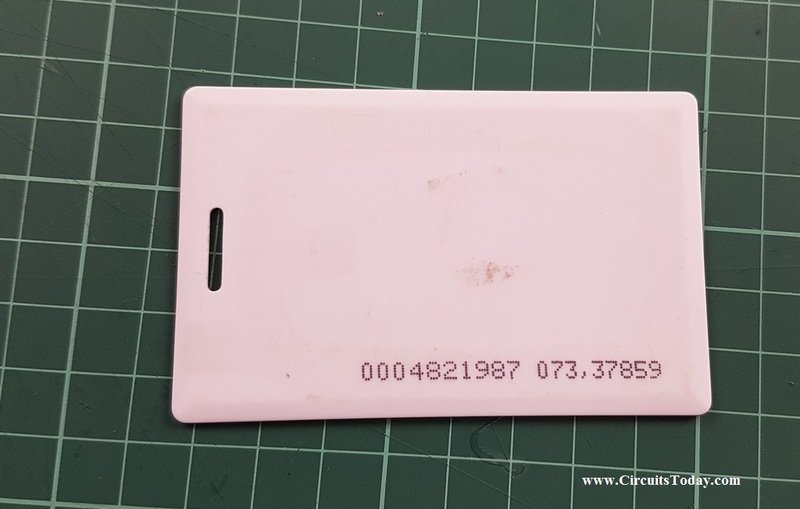 This is how the inside of an RFID tag look like (a smart card shape RFID tag). RFID tags come in different shape and size (say like that of a key chain or a button cell etc). 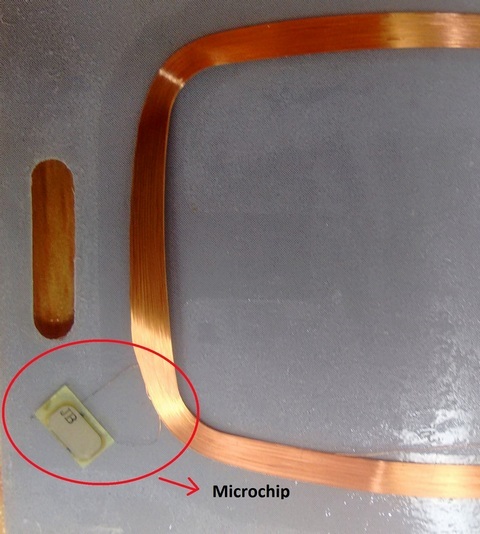 The copper wire acts as an antenna and also provides the necessary power to the tag.This antenna is connected to a chip as shown in the image given below. This chip is the key component of an RFID tag. The chip has an EEPROM (which stores the unique identification code and other essential data if any) and also has a circuitry for the logical functioning of the chip. an antenna to send the modulated information to air medium. Race time monitoring is one of the most important application using an RFID system. Providing security to access restricted areas. E passport helps in avoiding manual errors and maintains accurate data. RFID technology is implemented in e passport. Many developed countries already employ E-passport system. Electronic toll collection is another application ofÂ RFID technology. In this system, when the vehicle nears he toll gate, the RFID reader automatically detects the tag attached to the vehicle. This way the system collects the essential data of the vehicle from tag and deducts the required amount . Library systems can be easily managed using RFID technology. This helps in easy management of the users data and also helps identifying the book positions much faster and easier. People tracking systems are mostly used in jails and hospitals. In hospitals they are used for tracking the special patients and new born babies. In jails,jail inmates can be monitored using RFID technology.US states like Michigan, California use RFID technology to monitor jail inmates. Animals can also be tracked in a similar way. RFID tag is attached to the animal skin which is of the size of a rice. Some institutions & companies have uniform based dress code (for example: Casinos). RFID systems can track which uniform is assigned to which employee, age of cloth and number of times the cloth is washed etc. RFID systems can also be used for monitoring attendance in educational institutions and in offices. RFID based attendance systems eliminates paper works and avoids human errors that could arise while tabulating attendance manually. Note: We have published a project tutorial to build your own RFID based Attendance System. Read the project and try building one yourself. Different items in a retail store can be tracked easily using RFID systems. This helps reduce long queues in the stores. Automatic detection of products from customers shopping cart [when customer nears billing counter] and the bill can be produced much faster compared to manual barcode scanning. Generally , an RFID tag can be read from anywhere (within the specified range) with a perfectly equipped RFID reader. In some places like a retail outlet store, one can read the items (items with rfid tags) taken by the customer with a simple RFID scanner. In order to avoid this scenario and to provide extra security, a command is send to the ‘tag’ to put the tag in a deactivated state so that the tag can not be read once it is out of the store. The tag is reactivated when it enters into the store again. Such tags are called as zombie tags.